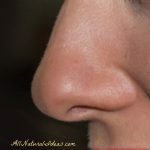 You are here: Home / Beauty / Is Using Apple Cider Vinegar Toner for Skin Effective? Got oily skin? Some people suggest ditching concealer and instead using an apple cider vinegar toner for skin problems, including acne. But is it safe and effective? How do you use it? And is there even proof it works? What can’t apple cider vinegar (ACV) do? 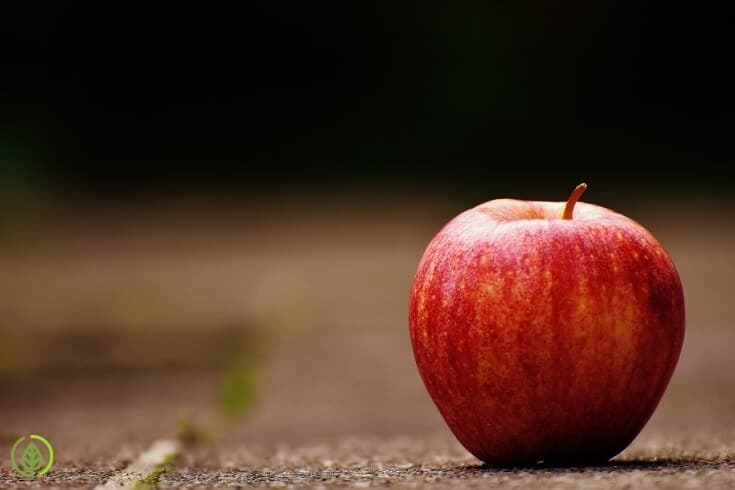 This harsh-tasting fermented apple juice can help manage diabetes. You can use ACV if you have a urinary tract infection. And you can even use vinegar to clean your kitchen and whiten your teeth. The benefits of drinking apple cider vinegar have been of growing interest lately. No wonder why ACV is one of the best-selling natural health products. In fact, global sales of ACV was valued at nearly $750 million by the end of 2017. That number is expected to top $1.2 billion within a half decade. That’s a lot of crushed apples. One reason for the rise in popularity of ACV is celebrities who swear by it for skin. Scarlett Johansson, Megan Fox, Miranda Kerr, Hillary Duff and Fergie are just a smattering of ACV-worshipping goddesses who swear by the sour stuff. Some people, celebrities included, drink a tablespoon of ACV (in a veggie juice or protein shake) every day. But a more recent beauty trend is using an apple cider vinegar toner for acne and other skin problems. Does this fad really work? 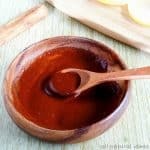 Can using ACV topically really help you get rid of acne or skin blemishes? And is it safe? Well, for starters, let’s answer the safety question first. Using an apple cider vinegar toner is safe. But only if you dilute the vinegar. More on that later. If you don’t dilute it and leave the ACV on your skin, it can lead to burns or other serious skin damage such as ulcers. 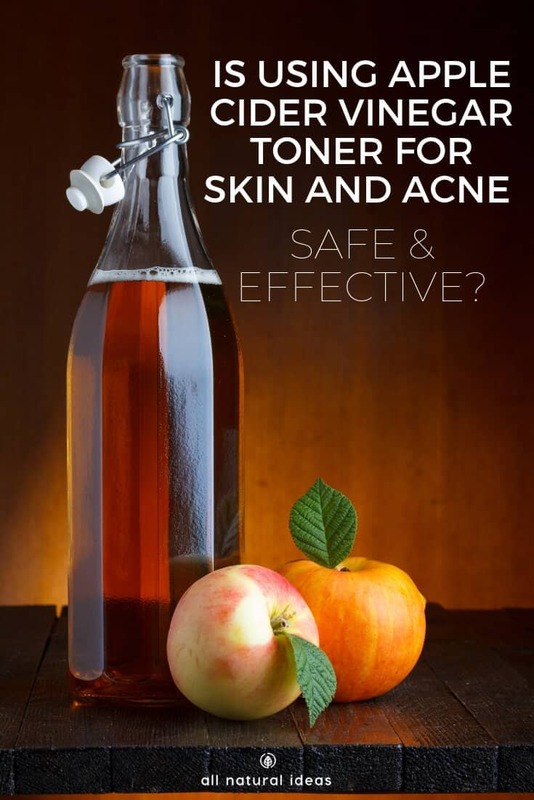 Before discussing how to use apple cider vinegar for acne, let’s address why toners are beneficial in the first place…. Why use a toner for acne in the first place? Some people try to hide acne and skin problems. They use concealers and other makeup to hide problem areas. This creates a viscous cycle because many of these products contain petroleum-based ingredients. Petroleum-based ingredients often cause more acne breakouts in the long run. On the other hand, gentle facial toners can help remove excess oil from the skin. Because ACV is very acidic–about 2.5 pH, the same as your stomach’s digestive acids–some people think that the acidity in ACV neutralizes excess oil. Toners also remove trapped dirt from skin cells. This trapped dirt can lead to acne buildup. But toners can also contain harsh ingredients that can rob the face’s natural oils. 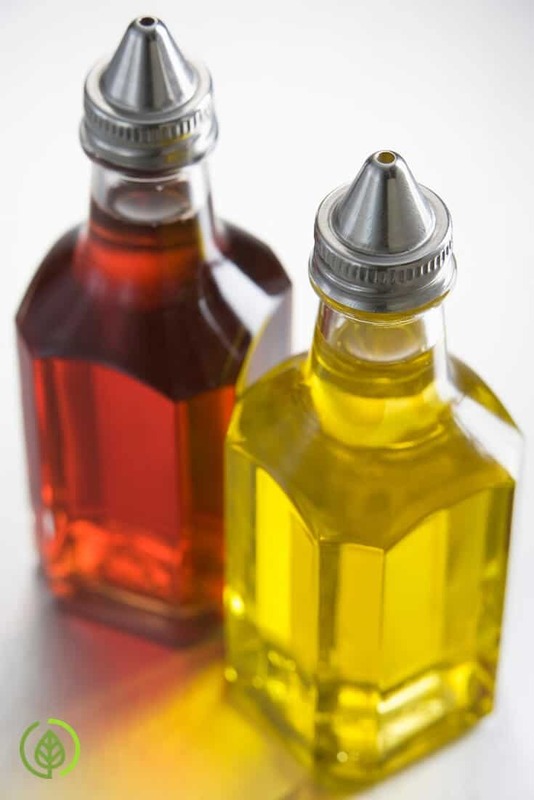 While it’s true that acne is often caused by too much oil, you don’t want to strip your skin entirely of oil. This is perhaps why using ACV toner has become more popular. There are no synthetic ingredients in it. Some people don’t realize that slathering lots of sunscreen can also contribute to acne buildup. This is another reason why a toner may help with your skin. In addition, toners can shrink pores, help detoxify the skin, moisturize and prevent in-grown hairs. If you have bad acne, an in-grown hair is probably the least of your worries. However, keep in mind that an in-grown hair may lead to a localized flare-up. Why Does Apple Cider Vinegar Toner For Acne Work? Because of the very acidic nature of ACV, it fluffs away dead skin cells. ACV also has been shown in lab studies to kill bacteria. However, keep in mind there are no studies involving humans that prove ACV cures acne. That being said, though, it’s possible the bacteria-fighting properties in ACV can clear skin. After all, acne is a manifestation of bacterial overgrowth. If you believe everything you read online, ACV will help your skin feel softer. 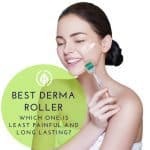 It will also minimize pimples and acne scars. Should you throw away all your facial cleaners and just use apple cider vinegar toner? Well, as long as you dilute it, it’s got to be better for you than toxic skincare products. If your skin is on the oily side, an ACV toner may indeed help balance out your skin’s pH. The pH on your skin is about 5. Remember, ACV is very acidic at 2.5 or so. Keep in mind the difference between 2.5 and 5 is not a simple subtraction equation (2.5). On the contrary, just an increase from 2.5 to 3.0 is huge. Therefore, if your skin isn’t excessively oily in the first place, using ACV could cause your skin to dry out. Mentioned above at least a couple times is the fact that you need to dilute ACV. So in case you this warning didn’t register yet, do not use full-strength ACV on your face. Or any other part of your skin. A safe ratio for using ACV on your face is 1:10. That means 10 tablespoons of water for every tablespoon of ACV. Apple Cider Vinegar for Acne Doesn’t Work! Now, for some people who fail to heed the dilution warning, ACV for skin problems not only doesn’t work, it can cause severe problems. And for some people who are careful in how they use ACV for acne, this all natural method doesn’t seem to work. According to this skeptic , “There is not much research or concrete data to back up … claims” that ACV for acne works. While there is decent data to prove that ACV: 1) reduces blood sugar and insulin levels; 2) kills certain bacteria and viruses; 3) can improve digestion; and 4) helps the body detoxify, there’s just insufficient research on it to prove that it works on very problematic acne. Nonetheless, using an apple cider vinegar toner is much cheaper than visiting a dermatologist. This is especially true if your health insurance does not cover treatments administered by a specialist. As this related article on drinking ACV for acne explains, the mother refers to the milky, sediment that you’ll see in the bottle. This sediment contains the therapeutic enzymes and proteins. Don’t try to save money on ACV buy purchasing the cheapest bottle you can find. Once you have an organic, unfiltered and raw ACV handy, pour a tablespoon into a mason jar. Above, it’s mentioned that you should dilute the ACV with 10 parts water. This is a good starting point to test how your skin responds to the ACV. If you don’t experience any negative reaction, you can slowly over time, reduce the ratio. Eventually, if you don’t have sensitive skin, the ratio can be lowered to one part ACV and 3 parts water. To apply ACV toner to your face, simply shake the jar to make sure the ACV is diluted. 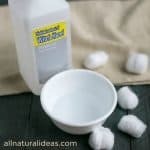 Then, pour some of the liquid onto a cotton pad and apply it to the affected areas. Ideally, your skin should be clean and dry before applying the cotton pad. You can use this remedy daily. However, keep in mind that acne may be caused not only by excessive oil. It can also be the result of internal imbalances. An internal root cause of acne is not having enough good bacteria in your large intestine (gut). To improve your gut bacteria, take probiotics. Also, if you don’t have enough stomach acid to break down food into nutrients, that, too, can cause acne. If you have frequent gas and bloating, this is a sign that you may not have enough stomach acid. There are supplements such as HCL you can take. Another way to improve your internal imbalances is to drink ACV. While there’s no clear-cut scientific proof that ACV for acne works, perhaps applying it topically and drinking it can benefit overall health. And when you improve your health from the inside out, your skin will clear up. What do you think? Does ACV help clear up acne and other skin problems? Have you tried it? What’s been your experience? Leave a comment…. 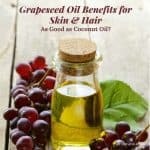 Grapeseed Oil Benefits for Skin and Hair: Worth trying? 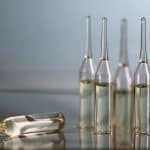 Pure Hyaluronic Acid Serum: Fountain of Youth or Snake Oil? What are the Witch Hazel Uses for Face?